Following days of violent protests in Milwaukee, Governor Scott Walker says the most important role of government in the city right now is to protect the safety of the public. Demonstrators have been taking to the streets since Saturday night, after a Milwaukee police officer fatally shot an armed black man in the city’s Sherman Park neighborhood. Police have said 23-year-old Sylville Smith was turning towards the officer with a gun in his hand at the time of the shooting. The protests have resulted in multiple injuries and numerous incidents of property damage, including burned buildings and rocks thrown at police squad cars. Mayor Barrett on Monday instituted a curfew for anyone 17 and younger that was set to take effect at 10pm. Walker said his “hope and prayer” for the city is that things will calm down. Walker also responded to critics who have claimed economic conditions in Milwaukee’s black community have helped fuel some of the violence in recent days. The governor says those concerns are ones he has been working with lawmakers from the city to address, through actions such as job training programs. As lawmakers fast-track legislation that would overhaul Wisconsin’s campaign finance laws, Governor Scott Walker signaled on Tuesday that he does expect some changes to the bill before it lands on his desk. The bill, introduced last week, would double contribution limits to candidates, require more frequent filing of finance reports, and make clarifications on corporate contributions to political parties and committees. It would also remove restrictions on candidates coordinating with outside issue advocacy groups, which Republicans argue is needed to bring the state in line with a state Supreme Court ruling earlier this year. During a stop in Madison, Walker said it’s important to make changes that will reflect some of the numerous court rulings over the years that have impacted the state’s campaign finance laws. He also said it’s a good idea to give more attention to political parties participating in elections, which the bill aims to do by increasing contribution limits to candidates and requiring more frequent reporting of campaign finances. Walker did express some concerns when asked about a provision in the bill that some experts believe would lift restrictions on how candidates spend their leftover campaign funds. Current law only allows candidates to direct that money to other campaigns, political groups, or charities, but Government Accountability Board director Kevin Kennedy said Tuesday that the bill could end that prohibition. Kennedy later walked back that comment at a legislative hearing, saying GAB staff may have misunderstood the provision. The campaign finance bill was the subject of a hearing at the state Capitol on Tuesday. It’s expected to make its way through the Legislature quickly this fall. Governor Scott Walker was able to score some hits in the second Republican presidential primary debate, although one expert thinks the chances of it boosting his lagging campaign are questionable. When he was able to speak, Marquette University political scientist Charles Franklin says Governor Walker was able to clearly communicate his position on a number of the key issues he’s campaigning on, and also addressed criticisms from other Republican candidates. However, Franklin said the governor did not get very many questions through the three hours of the debate and, as a result, ended up with the least amount of speaking time out of the 11 candidates on stage. Franklin said that limited exposure could make it harder for Walker to count on the debate to help boost his falling poll numbers, where he’s dropped out of the top tier in the past month. “It’s hard to see how he gets a bump from last night’s performance,” Franklin said. Despite polling at just two percent in some states now, Walker was included in the main debate because of his stronger standing during the time period used to determine who would appear on stage. However, with his numbers falling, the Republican governor now finds himself in danger of losing his place for the next debate that’s coming up at the end of October in Colorado. “He certainly needs to find a way to reverse the decline he’s seen…which really threatens to take him out of the top tier of candidates,” Franklin said. 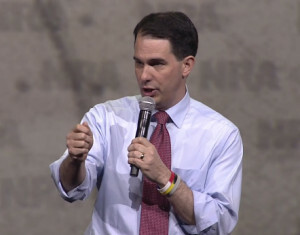 Walker will be back on the campaign trail this weekend, with stops that include visits to South Carolina and Iowa. Gov. Scott Walker addresses an NRA convention in Tennessee. 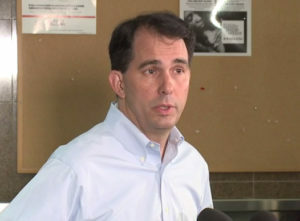 Walker, a potential 2016 candidate for president, recently changed his stance on supporting a path to citizenship for those in the U.S. illegally. During an appearance Tuesday on conservative radio host Glenn Beck’s program, the Republican governor stood by his recent comments that he now opposes amnesty for undocumented immigrants. Walker said there needs to be a discussion on what the nation’s legal immigration system is doing to citizens looking for jobs, and what it’s doing to wages. While speaking at Washington free market think tank, Governor Scott Walker defended his policies on public employees including collective bargaining changes and requiring higher pensions and health contributions. In today’s talk, “Are Wisconsin’s Budget Reforms a Model for Other States,” Walker said the issue is not only favored only by Republicans – as Democrats such as N.Y. Governor Cuomo, Mass. Governor Patrick and even Chicago Mayor Rahm Emanuel also want labor changes. Gov. Walker said his fiscal policies are a way to protect the retirement benefits of those in public service. He mentioned states like Illinois – which fail to make tough budgetary decisions – are now looking to cut pension benefits. 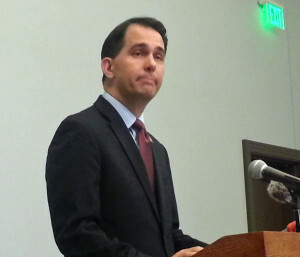 The American Enterprise Institute hosted Walker for the event. As the deadline approaches to turn in petitions to recall Gov. Scott Walker and Lt. Gov. Rebecca Kleefisch, Democrats are dispelling a few myths. The Dems have released their internal timeline leading up to the Government Accountability Board’s January 17 deadline. The recall headquarters in Madison plans on gathering petitions the week prior to organize the paperwork before submission. Democratic spokesman Graeme Zielinski said various blogs and sources are reporting erroneous information. “Another phenomenon are well-meaning volunteers who are leaking raw numbers of signatures versus the actual number of signatures that will be submitted after vetting,” he said in a release. Once the GAB receives the petitions, it will work to verify the signatures. Meantime there is a legal battle ensuing over the agency’s process. Walker’s campaign and the head of the state Republican Party say it should not be their job to find improper signatures. But the Accountability Board says the law only requires them to check the petitions for full names and valid Wisconsin addresses – and they don’t have the resources to do any more than that. Waukesha County Circuit Judge Mac Davis last week rejected a request by the recall groups to intervene, saying there’s not time to consider it before the petitions are filed. Davis also said the GAB’s position is the same as the recall groups, so they should be adequately represented in a hearing on the merits of the case, which is scheduled for tomorrow. The recall groups have asked a state appeals court to let them join the suit. In Senate recalls filed last summer, each campaign took up the task of reviewing the petitions filed with the state and making challenges against signatures. Now Republicans want the Government Accountability Board to do that work when petitions targeting Governor Scott Walker are filed later this month. GAB staff have said their only duty is to make sure each signature is complete and has a Wisconsin address with it, and that it’s up to the campaigns to file any challenges. Walker says that process worked fine last summer during the Senate recalls because there was not evidence people were signing multiple petitions, while media accounts this fall have indicated some people may have signed petitions multiple times. Agency officials say being forced to strike signatures would significantly add to the cost of reviewing the recall petitions, with over 540,000 signatures expected to be turned in later this month. The GAB also argues such a review goes beyond what the law requires the agency to conduct. Before this year, Wisconsin had only seen a handful of successful attempts to recall public officials. That changed dramatically last spring, as recall efforts against 16 state senators got underway. The recalls were based on where lawmakers stood on the collective bargaining issue; Democrats for leaving the state to prevent a vote and Republicans for supporting the bill. UW-Madison Political Scientist Charles Franklin called it a very unusual situation to see so many lawmakers targeted all at one time. Thousands of signatures were needed and several of the campaigns fell short of their goal. More than enough signatures were gathered though to force elections against six Republican and three Democratic lawmakers. David Vanderleest, who helped organize the effort targeting Green Bay Democrat Dave Hansen, says the polarized environment caused by the collective bargaining debate made it easy to get people to sign. He noted how clearly the state was divided at the time. Vanderleest unsuccessfully challenged Hansen in the race, which was the first to be resolved. Following a legal battle over signature challenges to the petitions, primaries for the rest were set for July. Republicans drew criticism for running “fake Democrats” in some of those races, a move Senate GOP Leader Scott Fitzgerald defended as necessary because it gave their members an extra month to campaign after the budget debate. Without primaries, those elections would have been held in early July. The six Republicans were the first to face elections on August ninth. Democrats fell short of winning the three seats needed to control the Senate, but state Democratic Party Chairman Mike Tate said defeating Senators Dan Kapanke of La Crosse and Randy Hopper of Fond du Lac was still a big win. Republicans argued their ability to hang on to the majority was a sign that results beat out rhetoric with voters. The two remaining Democrats successfully won re-election a week later. Despite falling short of their goal to flip the Senate, Democrats have kept their focus on recalls. In November they launched a drive to collect the more than 540,000 signatures needed to recall Governor Scott Walker. Four more GOP Senators are also facing recalls. The state will find out in mid-January if those efforts will succeed.